If your wallet cries for help every time your utility bills come in the mail, then that’s a problem. 31% of Americans struggle to pay their utility bills and end up cutting back on essentials like food and medicine. Fortunately, there are better solutions to reduce your bills that don’t compromise your well-being. Reducing energy consumption is simple once you know how. Take a look at ten ways you can lower both your energy use and your utility bills. The main source of your washing machine’s energy consumption comes from heating the water. Washing your clothes in cold water instead can reduce energy consumption quite a bit. You should also pick up the habit of measuring your laundry loads. You might be used to dumping in as much of your clothing as possible, but that isn’t the best idea. Although your washing machine can probably handle large loads, your dryer can’t–this makes you waste more energy by using the dryer twice. Your home or apartment might be equipped with several incandescent bulbs. These bulbs use more electricity than newer energy efficient bulbs. Halogen incandescents, compact fluorescent lamps (CFLs) and light-emitting diodes (LEDs) actually use 25-80% less energy than typical incandescent bulbs. To save even more energy, consider installing dimmer switches. Using the dimmer on its lowest setting can help you reduce your costs. Don’t forget to turn the lights off when you leave the room as well. Heat pumps can function as both a heater and an air conditioner. It keeps your home cool using a minimal amount of electricity and can heat your home as well. Installing a heat pump is perfect if you live in an area where the temperature fluctuates from hot to cold. By using a heat pump, you’ll see significant savings on your heating bills. Check out this article for more information about the benefits of heat pumps. Did you know that some electronics still consume energy even when they’re turned off? TVs, video game consoles, and desktop computers are just some of the electronics that could be secretly raising your electricity bill. Instead of shutting off your electronics, you need to make sure they’re not wasting any electricity. You can do this by unplugging them, or by shutting off the power strip that they’re connected to. On the other hand, you can also consider purchasing energy efficient power strips. These power strips automatically cut off the power to electronics that aren’t being used, and can finally let you save on your electric bill. Having the wrong type of windows can instantly spike your heating and cooling bills. Windows that aren’t energy-efficient can let out the precious heat and conditioned air that you paid for. Using double-pane windows can prevent heat from escaping. Windows with low-e coatings also help to reduce the loss of heat and cold air. Warm and cool air doesn’t just escape through your windows. It can even slip out through the cracks in your doors, windows, and vents. Make sure to seal these leaks so you can stop wasting money on expensive heating and cooling bills. In order to seal your house, you can use caulk or weather stripping. Place caulk in areas that aren’t moveable, like the space between your wall and the window frame. Weatherstripping can be used for cracks in areas that can be moved, such as your doors and windows. It’s also common for air to leak out from light fixtures, ducts, or doors and into your attic. Since hot air rises, it can find a way through these cracks and seep upwards. Make sure to properly seal off your attic so no extra heat can escape. Many utility companies actually give you a discount if you use power during off-peak times that start around 8:00 pm. You may have to adjust when you do your laundry or wash your dishes, but it’s worth it. Call your utility company to see if they offer discounts on power during certain times of the day. If you’re wondering how to save money on electricity, this is a great way to do it. You probably wouldn’t think the way you wash your dishes can result in reduced energy consumption. But it’s true–your dishwashing routine can impact your utility bills. The first step in making your dishwasher environmentally-friendly is to use a rinse aid. This chemical allows dishes to dry on their own without having the dishwasher use heat to dry it for you. Simply stop the dishwasher once it starts drying the dishes, and start saving on your heating bill. Before you put your dishes in the dishwasher, how do you pre-wash them? If you wash them too thoroughly, it wastes water and defeats the purpose of having a dishwasher. When you pre-wash dishes, remember that you don’t need to remove all the food from the dish. You can keep your ceiling fans on when you’re home, but there’s no point having them run when you’re not. Ceiling fans only move air so you can feel a cool breeze. In other words, they don’t actually cool your house down. The next time you leave the house, make sure to shut off your ceiling fans to reduce energy consumption. Learning how to reduce energy consumption can help you get acquainted with landscaping as well. That’s because planting trees around your house can provide some much-needed shade and cooling. The extra shade during hotter months will have your air conditioner running less and less. Soon, you’ll see a lower cost on your utility bill. Give your bank account a break, and start implementing these energy-saving techniques. 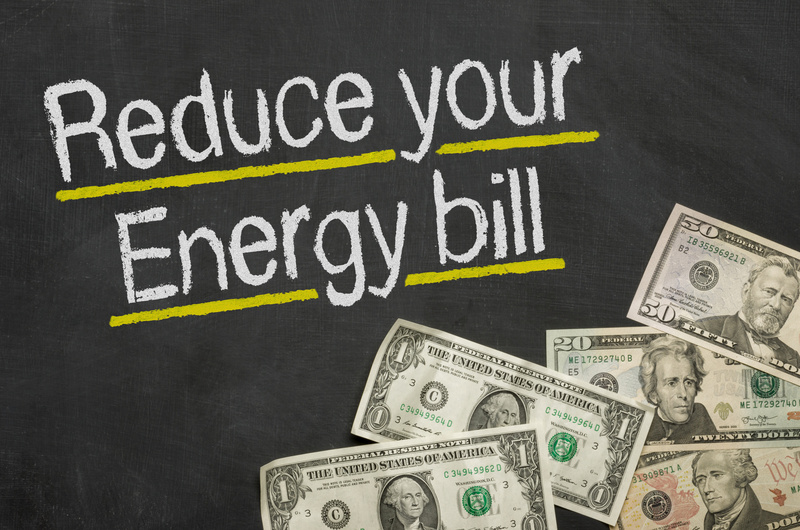 Reducing energy consumption will save you from wasting your paycheck, and can give you some extra spending money. Solar panels can also help you lessen the burden on your wallet. To find out more, check out the top five benefits of solar panels.